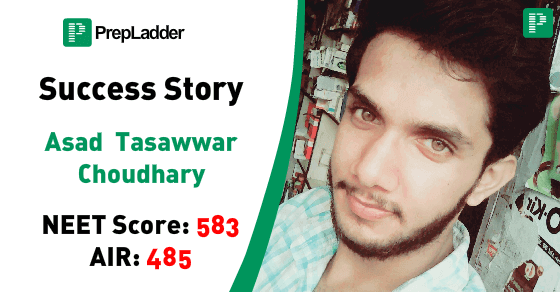 Today we feature the interview of Mr. Asad Tasawwar who scored 583 in NEET and secured an AIR of 485. He will be studying MBBS at King George's Medical University in Lucknow starting 2016. PrepLadder : Hello, Please tell us a little about yourself. Asad : Hello, My name is Asad Tasawwar. I am 18 years old from a middle class family in Meerut. My father runs a medical shop and mother is a house maker. PrepLadder : When did you decide to be a doctor? Asad : My father runs a medical shop and that always made me dream about becoming a doctor. I always believed in myself that I would one day achieve my goal. PrepLadder : That's amazing to hear Asad. Please share with us how you prepared for NEET, your strategy, your schedule. Asad : I always focused more on Physics as that was my main weak point. I practiced numerical questions in Physics and Chemistry with dedication. Asad : Early to bed, early to rise and absolute dedication is in my opinion the most important part of preparing for NEET. Always focus more on your weak points and work on them and you will gradually start seeing good results. PrepLadder : What was your strategy after 12th board? How did you plan your revision? Asad : After boards I went to join a coaching institute. Since I was pretty confident about doing well on the Biology section, my main focus was on numerical section especially in Physics and Chemistry. PrepLadder : Is time management difficult in NEET? How did you manage it? Asad : Yes this is a problem with most aspirants. I used to start my study from 6 a.m. till lunch break. I used to start my day with Biology and then gradually shift towards Physics and Chemistry. In the exam itself, the challenge is not to get confused. Don't trip over questions you do not know and start solving questions you are confident about. Also, keep in mind the negative marking. PrepLadder : Which books would you recommend to other NEET aspirants? Asad : This may sound cliche or boring but my main focus was NCERT books. In my opinion, you do not need any fancy books to prepare. Just keep your basics clear and be confident in yourself. PrepLadder : Did this year's confusion about NEET/AIPMT and the 2 NEETs bother you? Asad : Well, Yes. 2016 was a very confusing time for us medical students. There was no clarity and too much political interference. I am just happy that I was able to clear the test and grab an MBBS seat. Hopefully next year there will be no confusion as it becomes very difficult for us students. PrepLadder : Any final remarks? Asad : Thank you PrepLadder for this Interview. I hope anybody reading this can get a little bit inspired because of me and fulfil their dream of becoming a doctor. PrepLadder : Thank you Asad for talking to us. ! Asad : Thank you for having me Team PrepLadder.